Vietnam should push its pepper sector to increase the quality of its crop, rather than expanding the amount of land use to cultivate the spice, Minister of Agriculture and Rural Development Nguyen Xuan Cuong suggested at the Vietnam Pepper Outlook 2018 (VIPO 2018) conference in Ho Chi Minh City on Tuesday. 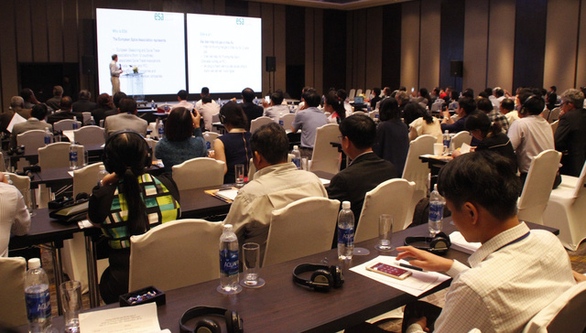 VIPO 2018 was organized by the Vietnam Pepper Association in collaboration with the Ministry of Agriculture and Rural Development and several other organizations to connect more than 200 pepper industry stakeholders, including retailers, exporters, importers, ministers, financiers, NGOs, and spice associations from Vietnam and abroad. Speaking at the event, Minister Cuong emphasized that Vietnam, which currently produces 230,000 metric tons of pepper per year or 48 percent of the world’s total, should consider the demand for its crop before increasing production. The minister went on to express his disappointment that the country’s pepper sector has yet to standardize the seedlings it uses or its cultivation process despite the industry’s massive US$1 billion export value. “From here on, our pepper [producers] should be chasing quality,” Minister Cuong said. The country currently boasts one-third of the world’s total pepper producing area, but Minister Cuong says growers need to shift their focus from quantity to quality by redirecting investment funds toward marketing activities and boosting crop quality to meet the standards needed for use in the production of higher-value goods such as perfume, beauty care products, and dietary supplements. Echoing Cuong was chairman of the Vietnam Pepper Association Nguyen Nam Hai, who shared that 100 metric tons of raw pepper can produce up to eight metric tons of oil valued six times higher than the same amount of peppercorn produced for spice. At the event, participants shared the current challenges facing the country’s pepper sector, including strict regulations enforced by export markets, the use of pesticides, and a lack of industry networking opportunities. They also used the event to put forward suggestions for the sector’s sustainable development. Vietnam’s pepper exports were estimated at 207,000 metric tons worth $678 million through the end of October 2018, up eight percent in volume but down 33 percent in value from the same period in 2017. The average export in the first nine months of 2018 was priced at $3,290 per metric ton, a 38 percent drop year-on-year.